This web site is a container for files that were too large to be included as attachments in correspondence. To examine your files, click at the right. Copyright © 2001 Winfield Hill. The materials I have created on these pages are presented for your own free personal use, but all commercial rights are reserved. 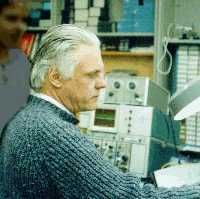 Trained as a physicist and electronics engineer, I'm by inclination an electronics circuit-design guru. As the Director of Electronics Engineering at the Rowland Institute for Science, I can indulge in one of my favorite pastimes, designing scientific instruments. In an earlier life, I founded Sea Data Corporation, a company of about 35 people that specialized in creating deep-sea physical oceanography and underwater coastal-zone instruments. Sea Data was a spinoff from my engineering work at Harvard University's Electronics Design Center in the early 70's. A favorite hangout, The Bench. Founded by Edwin Land after he retired from Polaroid, the Institute is a non-profit educational and research laboratory. Concentrating on high-risk scientific research, we have happily had excellent results. We've been on the covers of both Science and Nature, and have even made the front page of the New York Times. To help the Institute achieve its ambitious goals, my electronics team has created over 400 highly specialized instruments in the last 10 years. Update: On July 1st, 2002, the Rowland Institute became part of Harvard University and its name was changed to the Rowland Institute at Harvard. We operate as an independant "center" in FAS (the Faculty of Arts and Sciences) and remain located in our laboratory on the banks of the Charles River near MIT.